Imagine a world where your immediate space becomes your canvas and you can leave your mark anonymously wherever you go. floatnote is the newest and greatest platform for both self-expression and social media interaction. 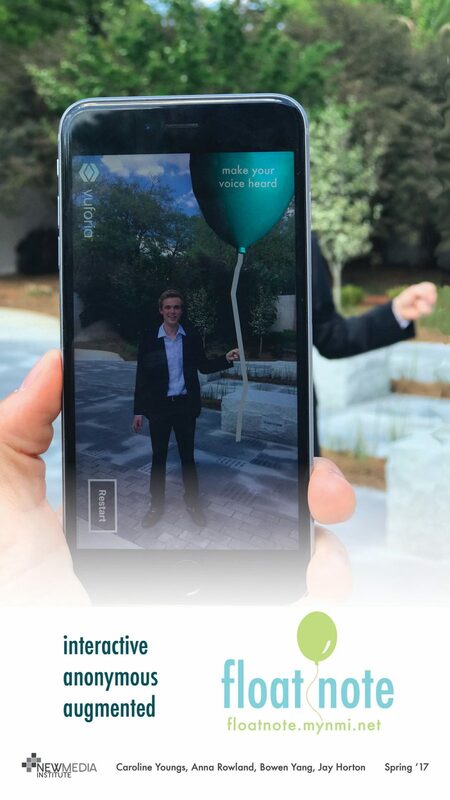 The app allows users to harness the power of augmented reality in order to leave virtual messages throughout their surroundings for other users of the app to discover. Anonymous messages will create the opportunity for people to express themselves in a whole new way to an audience that is exclusive to their space. These user generated messages will appear in the form of customizable balloons, and will be available within any physical space. There is a clear and unique void that exists in the social media space because it separates you from your reality. floatnote plans to fill that void… with balloons! The app uses augmented reality to create an alternative space for interaction by bridging the gap between the digital world and the real world. floatnote uses augmented reality to create an alternative space for interaction and expression. 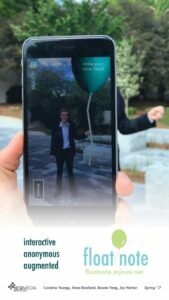 The users of floatnote can interact within their immediate space through notes posted onto the exterior of floating balloons. The app opens with a view of the whimsical logo. The twee colored palette, featured throughout the app, adds to the fantastical feel of the user’s experience. The app opens to a camera view of the user’s location. The user is then prompted to place a balloon on any area of the screen and a keyboard is revealed in order to write a message. The user can choose a unique color for their balloon depending on their mood or preference. Once the balloon is placed, it will land 50 centimeters in front of the user’s device at a height of 5’ 8’’. The floatnote is now public for the world to experience. floatnote uses augmented reality. Unity game engine was used to create the app and Xcode was used to deploy the app to a mobile device. floatnote was also built using Vuforia. floatnote is an Augmented Reality (AR) app as opposed to a Virtual Reality (VR) app because of the creative opportunities it presents and the popularity of AR apps in recent years. floatnote was created through experimenting with Markerless, Marker AR, and Geolocation. Ideally, sending this information to a database would be the next step. Although floatnote does not have any partnerships or clients currently, the app is a viable future media placement option for brands to advertise upon- specifically local businesses. The locality that is incorporated into the feature targets a very specialized market, and this could create a great revenue opportunity for floatnote in the future. In regards to monitoring the content — anonymity and quality control is of particular concern. There will be a system to report extremely offensive content and it will be removed based on the ratio of views to reports (10% would constitute a review). The higher the percentage, the more priority placed upon the review by the moderator. This way, the community ultimately determines the content. floatnote will also require its user to register with another social media account or an email address so that it remains anonymous but repeat offenders can be taken down after over 5 removed balloons. The app also regulates anonymous content organically because it is not truly anonymous, as it is based off of location/ immediate space. floatnote wishes to ensure that its users have a safe space to express themselves and facilitate conversation, and will not tolerate hate speech or other forms of harassment. Local Impact- floatnote facilitates meaningful and engaging conversation amongst college students and local Athens citizens. College campuses are rampant with mental health issues and feelings of isolation, but floatnote facilitates conversation and interaction between students and people in their immediate space in order to combat those issues. Social Impact- floatnote facilitates discussions and creates a voice for its users. In a world where social media has created a separation between the digital world and reality, floatnote merges the two into a fully integrated in-app experience. This allows users to recognize and maintain a connection with their immediate space and the people that frequent it. Global- floatnote helps to create an accessible world. It further relates and unifies different people from unique cultures over the singular idea of expression through augmented reality. Through the creation of floatnote, there have been many lessons learned as a result of research, design, and development. The research behind floatnote showcases how there are many different opinions on censorship, and it is a concern that remains a priority for the app. There were also many ideas and concepts that have been executed and changed over a brief period of time. One issue in particular was an app logo that was considered copyright infringement. We learned that it is necessary to ensure that the work that one creates is unique and original. During the design phase, there has been some controversy in regards to the twee color palette and whimsical logo, which has caused for many redesigns and edits. There was also some backlash in regards to the balloons themselves, as they are not necessarily a realistic feature and it is controversial to create augmented reality that is not realistic. This required floatnote to have specific reasoning as to why the balloon was chosen, which is because balloons create feelings of happiness and nostalgia. The floatnote will also move as a real balloon would in space, which creates a more realistic image. Development-wise, augmented reality has proven to be a challenge as well.